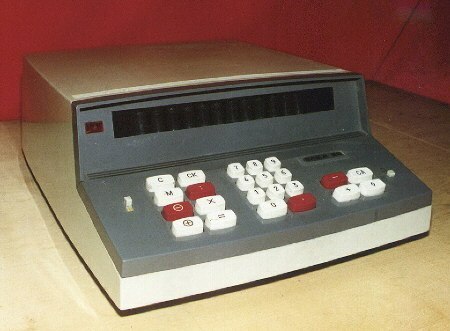 In 1986, calculators still represented an estimated 41% of the world's general-purpose hardware capacity to compute information. By 2007, this diminished to less than 0.05%. The 18th century saw the arrival of some interesting improvements, first by Poleni with the first fully functional calculating clock and four-operation machine, but these machines were almost always one of the kind. Luigi Torchi invented the first direct multiplication machine in 1834: this was also the second key-driven machine in the world, following that of James White (1822). It was not until the 19th century and the Industrial Revolution that real developments began to occur. Although machines capable of performing all four arithmetic functions existed prior to the 19th century, the refinement of manufacturing and fabrication processes during the eve of the industrial revolution made large scale production of more compact and modern units possible. The Arithmometer, invented in 1820 as a four-operation mechanical calculator, was released to production in 1851 as an adding machine and became the first commercially successful unit; forty years later, by 1890, about 2,500 arithmometers had been sold plus a few hundreds more from two arithmometer clone makers (Burkhardt, Germany, 1878 and Layton, UK, 1883) and Felt and Tarrant, the only other competitor in true commercial production, had sold 100 comptometers. The tube technology of the ANITA was superseded in June 1963 by the U.S. manufactured Friden EC-130, which had an all-transistor design, a stack of four 13-digit numbers displayed on a 5-inch (13 cm) cathode ray tube (CRT), and introduced Reverse Polish Notation (RPN) to the calculator market for a price of $2200, which was about three times the cost of an electromechanical calculator of the time. Like Bell Punch, Friden was a manufacturer of mechanical calculators that had decided that the future lay in electronics. In 1964 more all-transistor electronic calculators were introduced: Sharp introduced the CS-10A, which weighed 25 kilograms (55 lb) and cost 500,000 yen ($4457.52), and Industria Macchine Elettroniche of Italy introduced the IME 84, to which several extra keyboard and display units could be connected so that several people could make use of it (but apparently not at the same time). However, the efforts in integrated circuit development culminated in the introduction in early 1971 of the first "calculator on a chip", the MK6010 by Mostek, followed by Texas Instruments later in the year. Although these early hand-held calculators were very costly, these advances in electronics, together with developments in display technology (such as the vacuum fluorescent display, LED, and LCD), led within a few years to the cheap pocket calculator available to all. In most countries, students use calculators for schoolwork. There was some initial resistance to the idea out of fear that basic or elementary arithmetic skills would suffer. There remains disagreement about the importance of the ability to perform calculations in the head, with some curricula restricting calculator use until a certain level of proficiency has been obtained, while others concentrate more on teaching estimation methods and problem-solving. Research suggests that inadequate guidance in the use of calculating tools can restrict the kind of mathematical thinking that students engage in. Others have argued that calculator use can even cause core mathematical skills to atrophy, or that such use can prevent understanding of advanced algebraic concepts. In December 2011 the UK's Minister of State for Schools, Nick Gibb, voiced concern that children can become "too dependent" on the use of calculators. As a result, the use of calculators is to be included as part of a review of the Curriculum. In the United States, many math educators and boards of education enthusiastically endorsed the National Council of Teachers of Mathematics (NCTM) standards and actively promoted the use of classroom calculators from kindergarten through high school. ↑ "The World’s Technological Capacity to Store, Communicate, and Compute Information" Archived 2013-07-27 at the Wayback Machine., Martin Hilbert and Priscila López (2011), Science, 332(6025), 60–65; see also "free access to the study" Archived 2016-04-14 at the Wayback Machine. ↑ University of Alicante. "A Cordic-based Architecture for High Performance Decimal Calculations" (PDF). IEEE. Archived (PDF) from the original on 2016-03-03. Retrieved 2015-08-15. ↑ "Decimal CORDIC Rotation based on Selection by Rounding: Algorithm and Architecture" (PDF). British Computer Society. Retrieved 2015-08-14. ↑ "David S. Cochran, ''Algorithms and accuracy in the HP35'', ''Hewlett Packard Journal'', June 1972" (PDF). Archived (PDF) from the original on 2013-10-04. Retrieved 2013-10-03. ↑ "Pascal and Leibnitz, in the seventeenth century, and Diderot at a later period, endeavored to construct a machine which might serve as a substitute for human intelligence in the combination of figures" The Gentleman's magazine, Volume 202, p.100 Archived 2017-11-06 at the Wayback Machine. ↑ See Pascal vs Schickard: An empty debate? Archived 2014-04-08 at the Wayback Machine. ↑ In 1893, the German calculating machine inventor Arthur Burkhardt was asked to put Leibniz machine in operating condition if possible. His report was favorable except for the sequence in the carry Ginsburg, Jekuthiel (1933). Scripta Mathematica. Kessinger Publishing, LLC. p. 149. ISBN 978-0-7661-3835-3. ↑ Denis Roegel: Before Torchi and Schwilgué, There Was White. In: IEEE Annals of the History of Computing, October–December 2016, pp. 92-93. Retrieved 2018-05-06. ↑ "(retrieved on 01/02/2012)" (in French). Arithmometre.org. Archived from the original on 2013-05-21. Retrieved 2013-10-03. ↑ Felt, Dorr E. (1916). Mechanical arithmetic, or The history of the counting machine. Chicago: Washington Institute. p. 4. Archived from the original on 2016-07-03. ↑ Lott, Melissa C. "The Engineer Who Foreshadowed the Smart Grid--in 1921". Plugged In. Scientific American Blog Network. Archived from the original on 14 August 2017. Retrieved 14 August 2017. ↑ Ball, Guy; Flamm, Bruce. "The History of Pocket Electronic Calculators". vintagecalculators.com. Vintage Calculators Web Museum. Archived from the original on 3 July 2014. Retrieved 8 July 2014. 1 2 3 The Bulgarian ELKA electronic calculators Archived 2013-10-23 at the Wayback Machine., Clockwiser. Retrieved Oct 2013. ↑ ELKA 6521 (photo) Archived 2013-10-23 at the Wayback Machine.. Retrieved October 2013. ↑ ELKA 22 (photo) Archived 2013-10-23 at the Wayback Machine.. Retrieved Oct 2013. 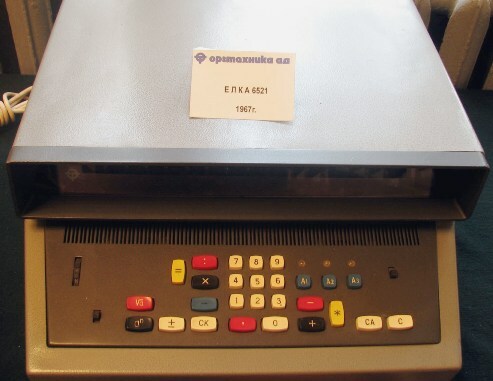 ↑ ELKA 22, Bulgarian Calculator Archived 2015-05-26 at the Wayback Machine., Soviet digital calculators collection Archived 2007-12-20 at the Wayback Machine.. Retrieved Oct 2013. ↑ ELKA 100 series (photos) Archived 2013-10-23 at the Wayback Machine., (photo) Archived 2013-10-23 at the Wayback Machine., Clockwiser. Retrieved Oct 2013. 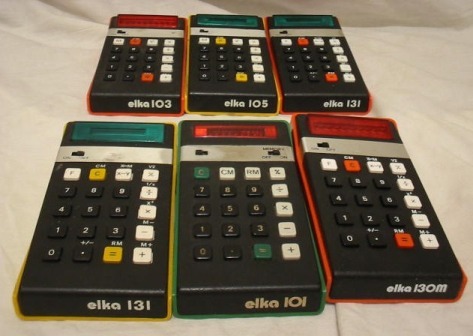 ↑ ELKA 101 description Archived 2013-10-16 at the Wayback Machine., Vintage Calculators. Retrieved Oct 2013. ↑ Texas Instruments Celebrates the 35th Anniversary of Its Invention of the Calculator Archived 2008-06-27 at the Wayback Machine. Texas Instruments press release, 15 August 2002. ↑ Electronic Calculator Invented 40 Years Ago Archived 2008-12-05 at the Wayback Machine. All Things Considered, NPR, 30 September 2007. Audio interview with one of the inventors. ↑ "50 Jahre Taschenrechner - Die Erfindung, die niemand haben wollte" [50th anniversary of calculators - the invention not wanted by anyone]. Wirtschaft (in German). Frankfurter Allgemeine Zeitung (FAZ). 2017-03-27. Archived from the original on 2017-03-29. Retrieved 2017-03-30. ↑ "The first calculators - How they got into your pocket" (PDF). American Heritage of Invention & Technology. 15 (4). 2000. Retrieved 2017-03-30. ↑ Reid, T. R. (July 1982). "The Texas Edison". Texas Monthly. ↑ "The First Handheld Digital Calculator Celebrates 50 Years". Archived from the original on 2017-04-13. ↑ "Microprocessor History". Spingal.plus.com. Archived from the original on 2011-07-20. Retrieved 2011-07-19. ↑ "The one-chip calculator is here, and it's only the beginning", Electronic Design, February 18, 1971, p34. ↑ "epocalc - Calculators". Archived from the original on 28 October 2016. Retrieved 30 December 2016. ↑ "U Bujama je izrađen prvi europski džepni kalkulator. Te 1971. koštao je koliko i fićo". Archived from the original on 4 March 2016. Retrieved 30 December 2016. ↑ "The Loan Arranger II". Mathcs.albion.edu. Archived from the original on 2011-07-19. Retrieved 2011-07-19. ↑ "Construction Master". Mathcs.albion.edu. Archived from the original on 2011-07-19. Retrieved 2011-07-19. ↑ Mark Bollman. "Mark->'s Calculator Collection". Mathcs.albion.edu. Archived from the original on 2011-07-19. Retrieved 2011-07-19. ↑ "Calculator Use in Elementary Grades". NCTM. Archived from the original on 5 September 2015. Retrieved 3 August 2015. 1 2 Vasagar, Jeevan; Shepherd, Jessica (December 1, 2011). "Subtracting calculators adds to children's maths abilities, says minister". The Guardian. London. Archived from the original on March 9, 2016. Retrieved December 7, 2011. The use of calculators will be looked at as part of a national curriculum review, after the schools minister, Nick Gibb, expressed concern that children's mental and written arithmetic was suffering because of reliance on the devices. Gibb said: "Children can become too dependent on calculators if they use them at too young an age. They shouldn't be reaching for a gadget every time they need to do a simple sum. [...]"
Ifrah, Georges (2001). The Universal History of Computing. John Wiley & Sons, Inc. ISBN 0-471-39671-0.